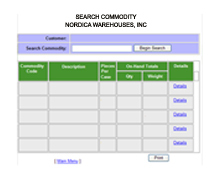 Nordica Warehouse letting technology work for you! At Nordica Warehouses we use the latest Internet and Security technology to communicate and maintain a safe facility. Our website is designed to communicate effectively. 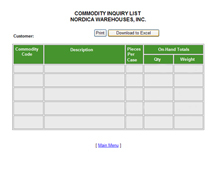 We offer our customers an Internet portal for access to the quantities of their product located at our facility. We add to it as shipments are delivered to our warehouse and subtract as shipments are taken out of it. so we keep an updated system that can be accessed from your facility to have current quanitity data. By having this level of communication we become, in fact, an extension of your company. We become your warehouse! You can access the reoprt any time! Our facilities are monitored 24 hours a day for your and our security. We also have systems to maintain climage control of several of the storage areas.